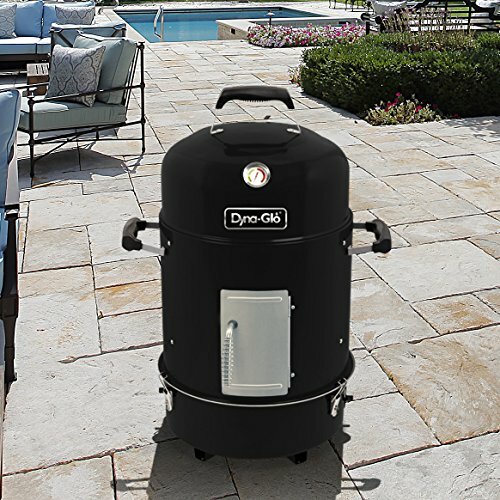 The Dyna-Glo compact charcoal bullet smoker boasts versatile cooking options & thorough heat distribution in a compact space. The removable middle section offers grilling & smoking functionality. This smoker offers a maintenance free cooking experience with a high capacity galvanized steel charcoal & ash chamber. For easy internal access, simply open the stainless steel side door. Adjustable base & lid dampers & stainless temperature Gauge provide the ability to read, control & adjust temperatures while cooking. So add this bullet smoker to your outdoor cooking repertoire today.